Welcome to Thebes is the latest in a genre of plays looking at Africa through liberal interventionist lens. Inspired by a Greek mythology, written by Moira Buffini and directed by the acclaimed Richard Eyre, the play portrays a female president - Eurydice - struggling to exert herself in a male-dominated political world. Athens - a global superpower with parallels to the modern day United States, is led by David Harewood’s Theseus, and this is where Eurydice seeks potentially compromising help. Alongside a company of 26 actors, the RADA- educated (the Royal Academy of Dramatic Arts) David Harewood is devoting all of his energy to the gruelling but enlightening rehearsals for Welcome to Thebes. “It’s a big piece about a whole range of different subjects - women in politics, war, the state of Africa, the relationship between Africa and The West; it encompasses a lot of very topical, deep and far reaching subjects. That’s what is so brilliant about Moira’s play - it manages to tell all of those very modern stories in a neo-classical setting. It’s a fantastic achievement,” he says. The father of two, whose roles have been mostly as serious as he himself appears to be, is reflective and thoughtful. It’s a characteristic mirrored by his responses, which are all carefully packaged and eloquent. “Because we’ve had the writer - in the room with us all the time it’s been a really collaborative process” he explains. “We have watched a film about Charles Taylor, ‘Pray the Devil Back to Hell’, about the situation in Liberia; it is also a dedication to those women of Liberia who basically stood in front of guns and marched in front of guns to end the civil war there”. Theseus could be seen as any number of US Presidents – leading a McDonald’s like chain of global military bases and a history of covert and overt military interventions - and Harewood, in giving life to the mythical Theseus, looked to Barack Obama in constructing his role. The forty-something actor has already portrayed Nelson Mandela in a recent TV biopic of the South African leader’s former wife Winnie (performed by Sophie Okenedo). In addition, Harewood’s depiction of Martin Luther King in the Olivier award winning production of The Mountaintop, was highly praised. Now adding an equally authoritative - but perhaps flawed - Theseus to his repertoire the star definitely has an affinity with these roles. “I do like playing strong characters. I like to fill them with a certain amount of humanity. I think that’s the interesting thing about the process - you start with an icon, or a character on the page; and it’s about putting flesh on the bone. With someone like Martin Luther King; before I played him he was not just a myth, but an icon. The more you read about the man the more you understand he had insecurities, fears, worries; it is so easy to idolise people in this culture of celebrity; (but) it is about humanising them. I really enjoy that process where you can pour all of your own insecurities, all of your own fears and worries into the character. If you play it the right way it adds certain humanity to these historical figures." With Romeo, Othello and Roman general Antony, already on his impressive CV, he’s enthusiastic to tackle other world leaders as well. Whilst Mandela and Martin Luther King are seen in a saintly light Harewood is not afraid to play those with a less pleasant reputation either. He mentions the former Liberian dictator Charles Taylor, currently facing war crimes charges in The Hague, and current President of Zimbabwe Robert Mugabe as subjects he would like to tackle. This deep research into the environment from which the character he is playing comes is an aspect of his work that he regards as especially intriguing and essential to the quality of his performance. “There is no way you can attempt to play any character without really researching what the character is talking about. It’s a good idea to immerse yourself into his thinking and what he achieved. When I played Mandela I think I fell for the whole 1990s ‘Free Nelson Mandela’ and it was only when I read his autobiography and the history of South Africa that I realised what kind of miracle it was,” he says. Whilst the actor has made a name for himself playing Shakespearian classics, he’s equally adept at playing figures such as Friar Tuck or the notorious Captain Poison in Blood Diamond. Having worked on stage, for the small screen and on more lucrative movie sets, he accepts that different roles require different skills and understands the pressures and challenges of these varying mediums. Not that Harewood is worried about being typecast. With his classical acting reputation assured he also reveals a ‘don’t take myself too seriously’ side when he contrasts the roles he has taken. “It is wonderful to come here and do great work that really stretches you and tests you as an actor. Then you can go off and do a bit of telly; (which) doesn’t require half as much attention or concentration. That’s the wonderful thing about the business -you get something new out of each project." Having himself played Friar Tuck - the much loved figure of English folklore - it appears as if colour-blind casting has achieved a strange victory. With many of his peers such as Adrian Lester, Chewitel Ejiofor and David Oyelowo having overcome the problem of stereotypical roles, Harewood’s knowledge and experience of the industry means he looks at the problems from a perceptive angle. With opportunities for Black actors in the period dramas, including Harry Potters, Lord of the Rings and Sherlock Holmes, perhaps the next barrier for Black British actors is that of equal recognition. Harewood concedes that commercial decisions very often override artistic ones at the development and casting stage. Football and clowning around in class appeared to be Harewood’s main passions as a teenager growing up in Birmingham, England. And it wasn't until a teacher encouraged the youngest of four children to try acting that he discovered his vocation. He was soon to win a place on a life-defining acting course at the National Youth Theatre, and completed his formal education at RADA, where he is now an associate member. Harewood has toured internationally with world renowned actress such as Vanessa Redgrave in Shakespeare’s Antony and Cleopatra in the 1990s, and he is heartened by the increasing numbers of Black people joining the profession since his stage debut almost two decades ago. Yes, there seems to be a small boom in acting for people of African descent in Britain, with African-American playwrights enjoying acclaim (Katori Hall and Lynn Nottage have brought their work to the UK to great success in Ruined and The Mountaintop and Pulitizer-prize winning August Wilson’s Joe Turner’s Come and Gone has just begun). However, Black theatre in Britain seems to be in the embryonic stage, despite writers of the calibre of Kwame Kwei-Armah, Bola Agbaje, Dipo Agboluaje and Roy Williams. Harewood, who plays Gus in the hit TV series Babyfather, appreciates the commercial potential and success - albeit one-dimensional - of recently made films in Britain but he is a little bit frustrated at the theatrical counterpart. And as commanding alpha male Theseus in Welcome to Thebes, Harewood is sure to prove that. 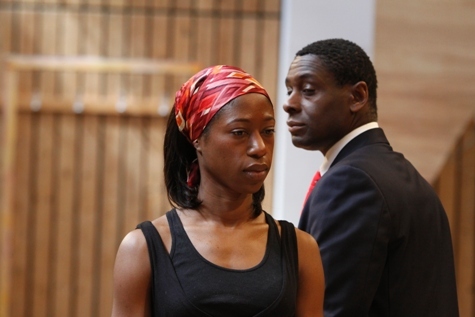 Image by Nobby Clark: David Harewood with the actress Nikki Amukah-Bird.